The philosophical approach to life and creativity, which is typical for the author, is also evident in this work. In the first line of the poem “The Road Not Taken” the author offers the reader an image of a road fork. Throughout life and every day of life, a person – and the hero of the poem is not an exception – makes certain choices. In the poem this situation is shown on the most obvious external image of the fork. The road branches out, and the wayfarer had to make a decision, choosing one or another road. His choice influences the duration, the comfort of the path and final result, so this choice is very important. Often it seems to the person that he knows exactly what is at the end of one of the roads, however this assumption is far from true. Withal further any path will surely contain new forks. 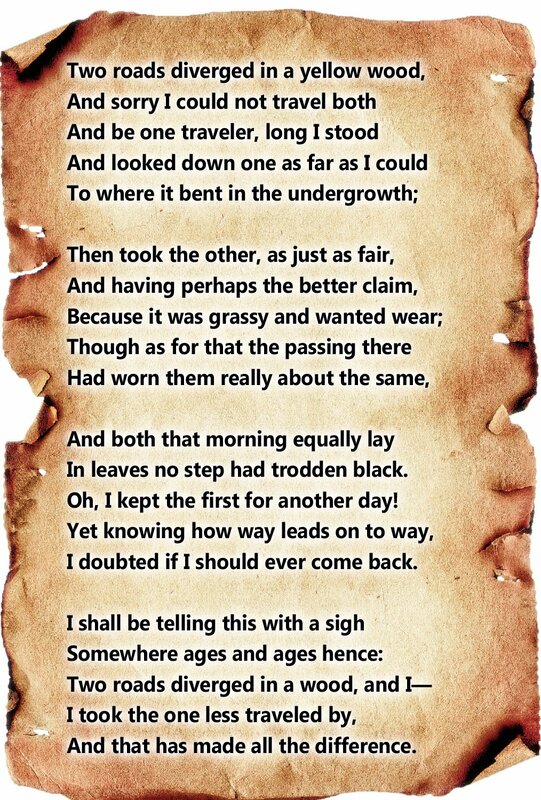 It is also important that there is no evaluation of the “right” or “wrong” way in the poem. For the author, it was important to emphasize this – any decision taken by a person has its consequences. And an attempt to evaluate all decisions only as correct or incorrect, complicates the path. The hero of the poem compares two roads. Both are approximately the same, although one goes to the undergrowth, and the other – to the other direction. 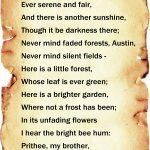 In the moment, which is shown in the poem, both roads are described by the author as sprinkled with leaves, and this means that there were no any travelers before the hero. There is no reason to follow another person, to use his choice “for the company“. There are all reasons to approach the choice, based on your own preferences and thoughts. Considering this picture as an image of time and life path, the reader is already differently look at the possibility of “coming back“. And the author confirms our conjecture – “I doubted if I should ever come back”. The road at the fork is converted into two identical roads. And each of them is equivalent to the other, although it is quite obvious that any choice leads to the fact that “And that has made all the difference“. At first glance, the poem has a descriptive momentary character. On the second – it is deeply philosophical and concerns the present time. However, we can also say that there is a future in it. But the hero of the poem does not even strive to appreciate this future. Nevertheless, his words “I shall be telling this with a sigh of Somewhere in ages and ages hence” are of great importance to the hero himself. He seems to reserve the right in the future to tell about this choice differently, what it looks like in reality. To tell, but do not force yourself to believe it. After all, in reality there are two absolutely identical roads in front of him. Thinking over the images of the poem “The Road Not Taken”, it is worth to learn its history. 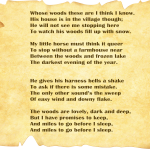 Robert Frost described it quite simply – it’s a greeting to his friend, Edward Thomas. A friend, also a poet, has repeatedly regretted the “other way“? which was not selected, about (perhaps) wrongly made choice. And this repeated return to “if” became the basis for writing this poem. Robert Frost was absolutely convinced that “there is no other way“, there is only the way that a person goes through. Only the choice that was made is real. As for the possibility of “going the other way,” it does not exist in the past. Nevertheless, such an opportunity is present, but only in the present. The poet himself wrote to Edward Thomas that such fruitless regrets about the unelected path are not a consequence of the choice itself. After all, if he chose another path, he would equally regret the missed opportunities of the “other way“. The poem has a convenient form for perception, and its images are accessible to the widest circle of people. Maybe the author wanted many interpretations of his poem? In this case, he certainly was pleased.